The Wynne Government's Achieving Balance: Ontario's Long-Term Energy Plan (LTEP 2013) isn't an energy plan; it's an electricity policy statement. LTEP 2013 is inadequate; in it's sole focus on electricity, it does not address energy security and it does not address greenhouse gas emissions. The winter of 2013-14 showed an increasing linkage, in Ontario and other markets (particulary New England) of natural gas and electricity. Cold weather strained natural gas supply, threatening blackouts and sending prices soaring. LTEP 2013 is therefore too narrow-focused to be an energy plan, and that limitation makes it unlikely to be a thorough electricity plan. To the extent a plan exists, it anticipates increasing emissions from electricity generation while failing to plan for sufficient production to securely meet demand in a future that is, in planning terms, too close for comfort. What LTEP 2013 "plans" on doing is continuing the mistakes that have driven prices up in the province since 2008.
emphasis on conservation and demand management before building new generation. In an earlier post I noted this has been the emphasis of every plan in Ontario back to 1980. Efficiency is very important, but the term conservation implies energy can be conserved which, for the majority of Ontario's electricity generation, is usually untrue/uneconomic. Ontario has been spilling hydro, diverting steam away from turbines at nuclear units, and forcing wind turbines offline at times. That energy is not being conserved - it is being wasted. Don't get me wrong; personally I conserve energy. Generally somebody using the term efficiency is worth listening to: not so people popping of on conservation. "Clean" is a weasel word amongst Ontario's electricity sector. For years the Ontario Power Authority reported wind, solar biomass/bioenergy and hydroelectric generation collectively as either "renewables" or "green" - maybe waste too ... clean was natural gas, particularly combined heat and power (CHP), and I think nuclear has also been in the clean camp. In LTEP 2013 "clean" seems to apply to renewables, although "conservation" is, appropriately for the application of this weasel word, defined as "cleanest." I don't think there's much hope in looking for clean if it mainly exists as nothing - better to look for dirt, which I'll do when digging into the numbers. Reliability has a couple of meaning in LTEP 2013. The most frequent usage of the term is made in referencing transmission and the grid. That's certainly a consideration as the province's major city had two major blackouts in 2013 - and those blackouts may be attributable to the failure to heed reliability planning in the past (see Building Blackouts). In 2004, Ontario’s supply outlook was not sufficient to meet North American reliability standards. Today’s margins are above required levels. The winter of 2013/2014 re-introduced the need for supply diversity exactly as Ontario exited coal. Fortunately oil-fired Lennox Generating Station existed to generate at times, as natural gas stores hit historically lower levels. The reduced diversity of Ontario's weakened supply mix was evident this past winter in higher prices, increased utilization of Lennox, and increased imports from the interties with the grid of the US states. These are not "clean" options. LTEP 2013 did not anticipate the supply issues experienced in the months following its December release. LTEP 2013 talks about the cost of electricity, but not in a sense that relates to pricing in competing jurisdictions. The document forecasts cost increases as lower than under the previous LTEP. It doesn't note the competitive need to control cost is more urgent now. The average all-in cost of electricity in the United states escalated only 6.5% from December 2010 to December 2013. Comparisons in Ontario are difficult as data is poor for actual delivered cost to different customer segments, but we know the commodity component (HOEP + Class B Global Adjustment) jumped 32% from 2010 to 2013. There is an importance in rising prices within Ontario; reduced discretionary spending being one aspect of the rising cost of energy, particularly on poorer households in the province. There is arguably a much greater importance to the competitiveness of the pricing with competing jurisdictions, and the new LTEP maintains an inefficient supply approach championed in the earlier LTEP. I don't take as meaning anything other than the current Premier would like to present herself as a communicator. I would think communities would be engaged by concerns over security of supply, pricing, pollution and being constantly bombarded with messaging about their wasteful ways; if they aren't engaged it's because they feel disenfranchised. Nothing in the LTEP 2013 empowers communities to do anything but acquiesce to Toronto's planning. My previous post framed this electricity plan in the context of earlier plans: it's primarily a political document. LTEP 2013 displays 8 supply components, including coal, which doesn't exist in the mix, demand response, conservation and planned flexibility. The Ontario Power Authority (OPA) has posted some of the figures behind the LTEP, and looking through the "Supply/Demand Balance" spreadsheet I suggest both "conservation" and "planned flexibility" aren't helpful. "Planned Flexibility" is shown entering the supply mix in 2019 - which is a rather short time frame for an unforeseen innovation in electricity supply. The supplementary material posted by the Ontario Power Authority reveals enough specifics to compare LTEP 2013 to the previous LTEP (2011) and the first Integrated Power System Plan (2007-08). 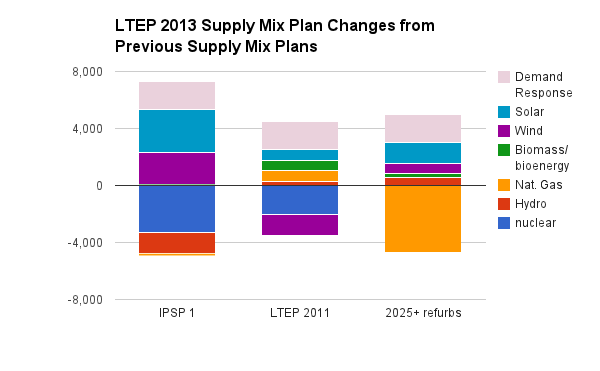 The LTEP 2013 supply mix isn't that different than one scenario I estimated in a post during the consultation period. : my "2025+Nuclear Refurbishment" scenario assumed, for 2025, all currently contracted supply is constructed, existing hydro and natural gas generators continue, Bruce A and B along with Darlington nuclear reactors are refurbished, and any remaining shortfall in meeting reliability standards is met with natural gas-fired generation. The change from 2008's IPSP to 2013's LTEP shows a big decline in planned nuclear capacity, and a lesser decline in hydro. Despite a net addition of capacity, the IPSP could meet reserve requirements, whereas LTEP 2013 can't (in 2025 the "planned flexibility", as the LTEP describes shortages, is 2,762MW). The change from LTEP 2011 to LTEP 2013 is a reduction of nuclear (again) and a reduction in wind capacity. Those reductions are planned as being offset by increases in bioenergy and, significantly, solar. LTEP 2011, like the IPSP before it, could meet the reliability requirements LTEP 2013 can't. My 2025 scenario of contracted supply, plus nuclear refurbishments and enough natural gas supply to meet reliability requirements, is different from LTEP 2013 primarily in the LTEP's "planned flexibility" trick (hiding that it doesn't meet reliability requirements), coupled with it's use of demand response to meet demand peaks. 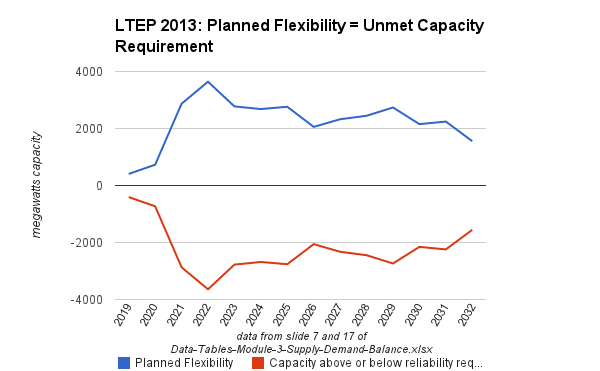 LTEP 2013 is not costed properly, and it does not provide a credible plan to meet reliability standards. I reported in an earlier article that the legal planning entity is the OPA and this LTEP, like the one preceding it, should be a starting point for the development of a thorough integrated power system plan (ISSP). This article has discussed the planning issues, but it has not addressed the operational issues that are impediments to delivering a clean, reliable, cost effective system honouring the principles LTEP 2013 purports to be built on. 15,100 from "light duty gasoline trucks"
3. The North American Electric Reliability corporation (NERC) is the entity the sets planning reserve margins. It is closely aligned with the U.S. Federal energy Regulatory Commission (FERC) which is looking at rules for a number of things following supply scares of winter 2013/2014, including what supply options are viable options in a functional capacity market, and what capacity margins are needed. Recent testimony of FERC Commisoner Philip D. Meiller illustrates a number of concerns. 4. With the exception of Thunder Bay, which is anticipated to cease being fired by coal late in 2014. 5. I noted inNatural Gas hikes impact on electricity pricing in Ontario "the primarily storage hub in Ontario hit "historic" lows"
6. I wrote LTEP Backgrounder: The Con in Conservation during the LTEP 2013's consultation period. 8. For one estimate of the cost of a demand response program, see these comments/calculations from analyst Bruce Sharp, on how expensive the Class A/Industrial Conservation Incentive (ICI) has been. Unsurprisingly, the expensive program is being expanded anyway. 9. The different plans have different levels of clarity on the supply mix. The breakdown of "renewables" in the 2011 LTEP wasn't well defined - and the definition for "Conservation" surely changed (it does daily). My assumption in 2011 was ~8000MW of the 10700MW of renewables called for would come from wind, and the vast majority of the remainder would come from solar PV.